We are coming to the end of reader request week-today's ink was sent in by Heather, you can find her @havenhursthanks on Instagram. So let's take a look at Montblanc Oyster Grey. Thanks to Heather for sending it in. You can find this ink for sale at Anderson Pens. Oyster Grey is part of Montblanc's standard line, so it should be available year-round. It is sold in 60ml bottles, cartridges and samples (depending on the retailer). Oyster Grey is a medium grey with a greenish undertone. In larger swabs the greenish undertone is more prominent. Ink swabs for comparison, left to right (top to bottom for mobile RSS): PenBBS #130 FDR, Montblanc Oyster Grey, and Diamine Grey. 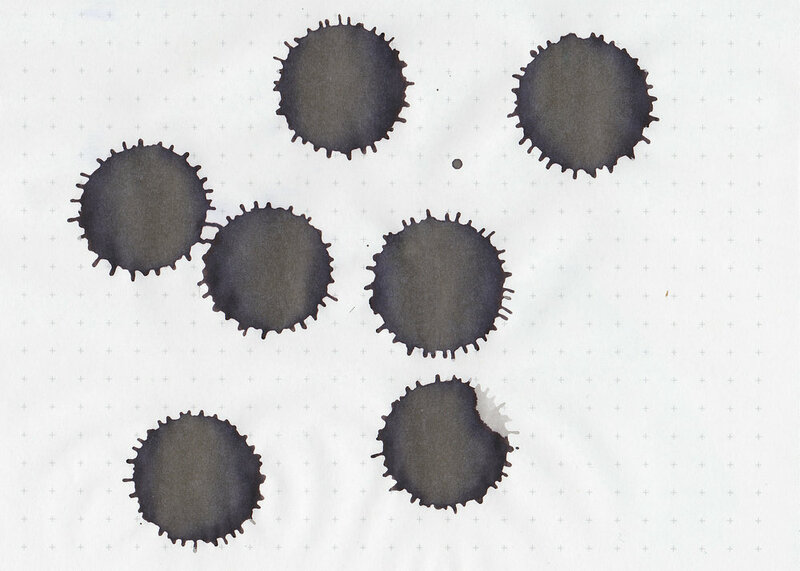 Click here to see the Montblanc inks together. Diamine 150th Anniversary Silver Fox, Diamine Earl Grey, and Pilot Iroshizuku Kiri-same. Click here to see the grey inks together. I think out of all of these inks, Kiri-same is the closest in color to Oyster Grey. 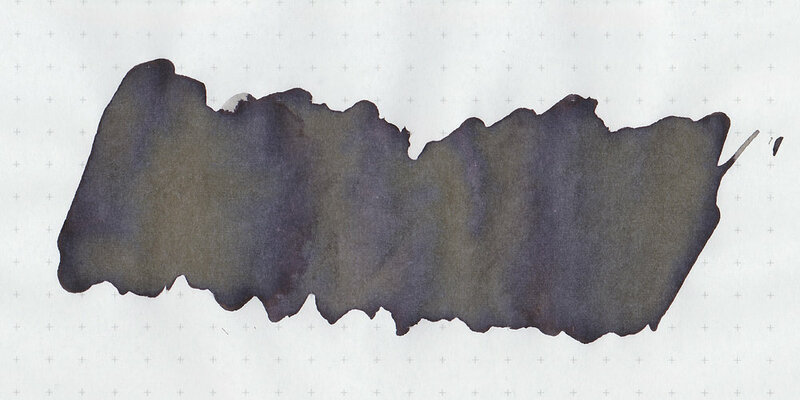 This ink looks pretty pale when wet, but darkens as it dries. I really love the shading that showed up in this ink/pen/paper combo. One quick thing I have learned about shading: more shading shows up in print than in cursive. I think it's just because you are picking up your nib more, so more ink pools as the nib is removed from the paper and put down again. 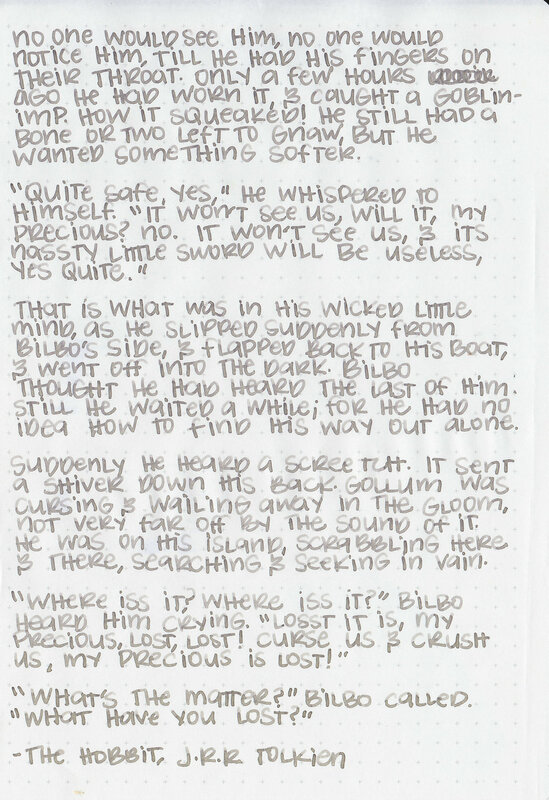 Overall, I love this ink in a medium Pelikan nib. It shows some interesting shading and looks nice. I love grey inks, so for me it's a good one. I prefer it in writing than in the larger swabs where it looks a bit too green to me. Give it a try, you might love it. Disclaimer: This ink was sent to me by @havenhursthanks on Instagram for the purpose of this review. All photos and opinions are my own. There are no affiliate links on this page.